"There’s going to be riots, there’ll be riots." Less than a week before a police shooting in the North London neighbourhood of Tottenham triggered the worst social unrest to hit Britain in decades, these were the words of a young man predicting the effect of youth club closures on his community. While the wanton violence and destruction still occurring in London and other places within Britain has shocked the world, it has not been as much of a surprise to many UK residents who have been warning of growing anger and alienation within British society, especially among youth. "There's income inequality, extremely high levels of unemployment between 16 and 24-year-olds and huge parts of this population not in education or training…there's a general malaise amongst a particular generation." The idea that we must not earnestly try to understand these actions is not only counterproductive but potentially suicidal in the long term. Far from being an isolated incident, these riots are but the largest and most recent incident of unrest to rock Britain in recent years. Most unrest has taken the form of protest, and has come in response to increasingly stringent government austerity measures and a perceived push to dismantle the social welfare state which has historically provided affordable healthcare and education to British society. In response toplans in 2010 to end government subsidies to UK universities, a move which would triple the cost of university education for the average student and largely destroy the meritocratic ideal of class mobility through education, tens of thousands of young Britons took to the streets in sometimes violent protests that in many ways appear to have been the harbinger of the riots we are witnessing today. Indeed, just a few months ago over 250,000 thousand people protested in London over further proposed cuts to social services, which nevertheless went ahead as planned. The Cameron government’s five-year plan of austerity measures is in only its first year and has already resulted in massive cuts to public sector services such as affordable housing subsidies, job training and culture and sports programs. 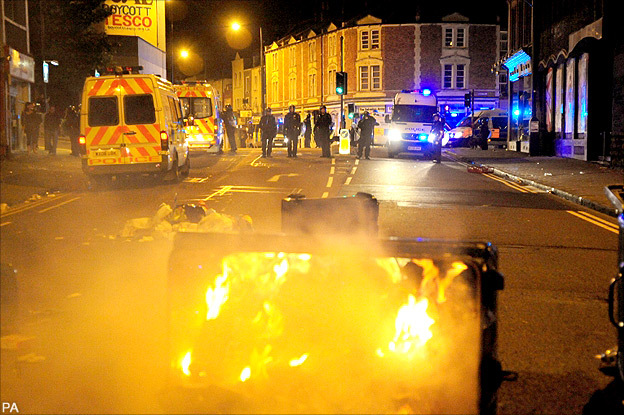 While this past week of rioting was triggered by a particular incident of violence, it can be observed to be part of a larger pattern of anger and frustration within British society. Government policies that have made circumstances increasingly difficult and often hopeless for those who live close to the margins of society are finally bearing results in the form of a huge number of disaffected, alienated youth without regard for the laws and norms of the country. While the violence and destruction of property which have occurred this past week are intolerable and worthy of full-throated condemnation, anyone with an interest in maintaining social cohesion should pay heed to the demonstrable results of economic hardship coupled with cuts to social services. The United States has experienced incidents of domestic unrest, some of which have culminated in rioting, but nothing yet on a scale as widespread as what has been glimpsed in Britain in recent days. The current debt crisis and the resulting debate around cuts to government spending is a time to reflect on the serious, tangible, effects of cutting social services. While spending must be curbed, too often politicians make, for them, the easy decision of cutting support to those who are already the least enfranchised members of society. The past week’s decision to cut subsidized loans to graduate students from the budget is a prime example of a short sighted policy which will save money in the short term but will be deleterious to long term social stability. Cutting off avenues of class mobility for young people is an excellent way to engender the type of anger on display in Britain this week. "In Chicago and other major American cities, the violent acts are singular and isolated. The violence in London has become collective and focused, but the underlying causes are the same, and as soon as American kids figure that out, we're in trouble." This debt crisis and the spending decisions it entails may constitute a potentially pivotal moment for the future of the United States. Following the lead of Britain and systematically dismantling the social welfare system may one day result in scenes of rioting and domestic insurrection playing out in major American cities as they are in British ones today. Cutting vital social services in order to protect the massive expenditures required to maintain the national security state and to continue funding countless directionless wars would be an extremely fateful failure of leadership as well as imagination. Had there been a terrorist attack in Britain this past week as opposed to social unrest, there would undoubtedly be a huge chorus of voices in the U.S. loudly extolling the necessity of maintaining and even increasing defence spending, but there has been no commensurate call for protecting social spending in order to avoid the danger of Britain-style unrest. Those seriously concerned with national security should awaken themselves to the fact that there is absolutely nothing safe or secure about soaking your country in gasoline by ignoring, and exacerbating, the plight of its most disenfranchised citizens. Eventually an event will come along to strike a match; at which time the meaning and utility of “national security” will quite viscerally move from the abstract to the concrete. Murtaza Hussain blogs at Revolution by the Book and is on Twitter at@MazMHussain.